To enjoy our participation in amateur automobile racing to the fullest extent possible, while providing our sponsors the maximum positive exposure and return on their advertising investment. Compared to many other amateur racing efforts, we are somewhat unique because we operate more as a team than a driver with a few friends who help at the track. We believe that this philosophy both increases our effectiveness at winning races, as well as improves our enjoyment of the sport. Everyone on the team believes that no job is too small for them; we all pitch in together. As the team leader, Wayne has produced two successive top ten finishes in the hotly contested MARRS series (50+ different drivers enter MARRS ITS races each season). In addition to being the driver for Mountain Motorsports for the last nine years, Wayne has developed substantial experience as a crew member for a number of successful teams that raced Datsun 240Zs. He was a member of Doug Christensen's team that won both the DC Region and MARRS championships a number of years in a row. During this time, he also assisted Jeff Werth's (three times National Champion in GT5 class) with their championship ITC Datsun 510. In 1993, Wayne was a crew member of the 2nd place ITS team (Men from MARRS) at the Longest Day at Nelson Ledges 24-hour production car race -- he has also crewed for Pat Sharkitt, the Men from MARRS owner/driver, at a number of MARRS races. Steve joined Mountain Motorsports in the middle of the 1997 season when he learned how much fun his brother John was having. With his mechanical background and interest in high performance automobiles, Steve quickly got up to speed and has become a significant contributor ever since. Steve is a two time award winner in concours for his immaculate Jetta GLI 16V. In his freshman year with Mountain Motorsports, John quickly filled the vacancies left when Eric and Terri Burstein moved to Florida. Drawing on his past experience as a jet aircraft mechanic and auto enthusiast, he learned the key points of SCCA racing and care of a Datsun racecar. John's managerial experience is part of the glue that keeps the team functioning together. Even though Mark's involvement with SCCA racing began with the formation of Mountain Motorsports, he has owned four Zs, beginning with the pristine '72 240Z he purchased in 1976. Mark currently owns a '75 280Z on which he is performing a ground-up restoration and conversion to semi-race car. When the chips are down, Mark is the one who rolls up his sleeves, and gets the job done. Lately, Mark has been taking a break from the track to pursue his #1 passion (golf), but he still consults in the garage. As a high school student, James has been learning about engines and automobiles. He is an avid reader of auto publications, very observant, and interested in becoming an automobile designer. Now that he has his drivers license, he has shown interest in driving a race car as well! 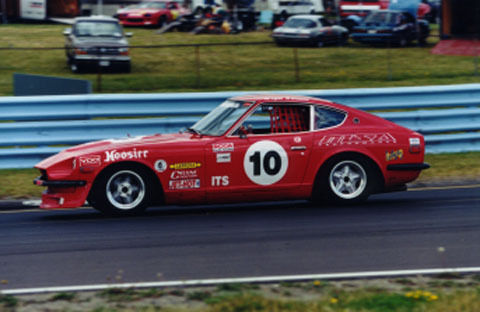 Back in the '70s, Ray raced a 240Z for Bob Sharp. Officially, he is a crew member for another race team, but whenever possible, his is the calm voice on the radio coaching Wayne to go faster. Ray is the original owner of a very nice '72 240Z. Arnie rarely misses a race and is always an upbeat supporter of our efforts. No matter how far we go to a race, he is there with us helping out and keeping our spirits up. A true Datsun and Z-car enthusiast, Arnie brings his dog Cirrus with him in his 240Z unless the track forbids it. Whenever we head South, Billy is there to help out. Living in South Carolina makes it difficult for him to get to our Northern races, but when he is there, Billy knows what to do and really contributes no matter if the job is trivial or crucial. Billy always has at least one 240Z to drive. Mountain Motorsports was formed in August 1992 by Wayne Burstein, Mark Manns, Eric Burstein and Terri Burstein. All members were owners of Datsun Zcars and all but Mark had racing experience. 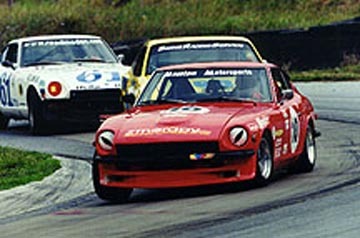 Our initial racecar was a 1973 Datsun 610 that had been raced by numerous people in the Washington DC region. Destined for the junkyard, we acquired it, cleaned it up, put on new tires, and went racing. Even before being stripped of its trick parts by the previous owner, the car was a mid-pack runner with talented drivers at the controls. During the 1993 MARRS season, we completed every track session we began (i.e. no DNFs) with positive results, considering the car we were entering. Our best lap times were three seconds faster than the region's chief driving instructor who rented the car for a race. For 1994, we acquired a 1973 Datsun 240Z that had been occasionally raced since 1986. It was the victim of a major engine compartment fire and required extensive work to get back into racing trim. Our goal for the year was to develop the car to the point of being competitive by the end of the season. The first race weekends of the season were full of surprises, with two complete failures of the brake system during races, and a transmission failure in a qualifying heat. Even with these problems, we finished each race! In 1995, we rebuilt the chassis from the ground up, making major changes to the suspension, roll cage, and driver safety and controls. Extraordinary family and career issues kept us from racing more than one race, but that one was quite successful. In a NATcS one hour enduro, we came from the back of the pack up to third place and first place in ITS. For fifty minutes, the second place ITS car tried at almost every corner to pass, but we were able to hold him off until almost the end of the race. Unfortunately, I made a mistake that resulted in a second place finish in ITS. Numerous people came by to congratulate us on the exciting race -- this provided excellent visibility for our sponsors! We got back to regular competition in 1996 and finished 7th in the MARRS season championship. Significant milestones were winning our first trophy and Wayne's development as a driver. In his first two years in the 240Z, he had not fully adjusted to the different car and it's increased capabilities. 1996 was the turning point for him and he demonstrated it by being competitive, composed and consistent. 1997 was a difficult and successful year. The original team members had remained with Mountain Motorsports until 1997, when Eric and Terri Burstein unexpectedly moved to Florida just before the beginning of the racing season. The loss of two talented and experienced crew members left a void early in the season that was painfully obvious; team style operations do not work without half the team. Competition also increased substantially in 1997 with two top drivers from another class moving into ITS and two former mid-pack drivers mounting serious efforts towards the championship. A 6th place finish in the 1997 MARRS championship was the result of lots of hard work for the newly reorganized team. Major milestones were three top 5 finishes, three additional top 10 finishes, and a pole position at Pocono. We were also running in second place at Connelsville when the transmission failed. Our plan in 1998 was to compete in limited MARRS races while getting the car in optimal condidtion for the 1998 ARRC. We competed in MARRS races at Watkins Glen and Summit Point and then headed for Road Atlanta for the SARRC Double and Pro-IT races over Labor Day. Our goals of learning the track and finishing in the top ten were met and we felt ready to be competitive in the ARRC after applying the knowledge gained to set up the car specifically for Road Atlanta. Unfortunately, Wayne came down with pneumonia a week before the race and we were unable to compete. With the car prepped for the ARRC, 1999 should have begun with our team in the hunt for a MARRS season top finish; however, we were not as competitive as expected the first couple of races. By the middle of the season, we were back on track with three MARRS podium finishes and a front row starting position. By the last race, we had moved up in the points standings from our initial 10th place into 4th position. A minor driving error in the last race dropped us back into fifth place in the highly competitive MARRS Championship (in many races, there were twenty cars qualified within two seconds of each other). In addition to the top-five finish for the year, we were proud to finish each race of the year in the top-ten with no DNFs and to be running near the track records at Summit Point and Watkins Glen. 1999 was a great year for sponsor exposure. The extremely competitive ITS class racing generated lots of spectator interest for the front runners. Our open hood policy in the paddock allowed us to discuss technical aspects of the car with the many spectators and racers. We also entered our racecar in a car show and displayed banners and handed out literature for our sponsors. Wayne was the featured speaker at one of the Washington DC Region's membership meetings and also made brief presentations at two of the Northern Virginia Z Car Clubs meeting. In each of these appearances, Wayne was able to present our sponsors' products and services in a positive light. And of course, Wayne continued to be an advocate of our sponsor's products and services to the thousands of subscribers on the Internet listservers to which he subscribes.